Holiday weekends are great for re-charging and re-connecting with friends and family. A four day weekend may stretch the limits of that theory. Keep one day to yourself. Look at the rest of your calendar year. Mark off the days you want to take vacation. Mark conferneces and training you want to attend. Fit work into the rest. While you’re at it, schedule time to just sit quietly. It’s silly that we’d have to set a timer to be bored, but these days, it’s an advantage. Consider buying some of your time back by hiring help. 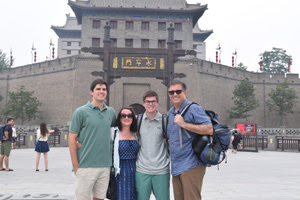 I’ve been watching the new PBS series The Story of China because host Michael Wood visits many of the same cities our family visited last year. What is striking about the way Wood tells the story is through 4,000 years of continuous culture, the number of ups and downs the Chinese have been through. They have been at the top of the heap or holding on to the bottom rung multiple times. It’s become part of who they are, the story they tell themselves. If culture is a collection of behaviors, it was easy to see on our trip that the Chinese were behaving as if their rise is inevitable. What has happened, will happen. It’s time to get back on top. In the stories we tell ourselves, the past is clear because it’s set, it has happened. The future is constantly changing. If you haven’t done this exercise recently, it’s worth doing this weekend. Remember what the world was like 10 years ago. Where your business came from and how you communicated with your customers. Now fast forward to 10 years from now. What changes? Where will you fit? Don’t panic, just let an idea form and play around with it. Today isn’t all that much different than ten years ago, but it’s easy to get lost in the changes. Answer these questions: What’s the same as it was ten years ago? What will probably be the same ten years from now? Quick note to my future self. If you have to ask the question, “Do you think this will support my weight?” don’t climb on it. 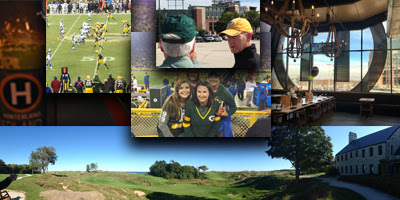 There are three “count me in’s” and two more who want to learn more about the Getting New Clients workshop in Lambeau. The interested parties are partners in law firms, a partner in a CPA firm, the owner of a marketing firm, and an entrepreneur. A good mix and the conversation could get lively. Let me know if you want to hear more. If you missed it, the idea is from my Ultimate Rainmaker series. It will be a day and a half of seminar/workshop. I want to do it in Green Bay this September, right before the Bears vs. Packers Thursday night game. If you’ve never been to Lambeau before, it’s amazing. If you have been there, this event will show you some new things. A good workshop is between 12 and 18 people. I have started making calls. I’ll have the details soon.